If you are a regular around here you have seen many times how much I love to grill :O) It is West Texas after all and well, that is what we do. Nothing is better then grilling a big steak and watching some football. Like many people I enjoy my steak with a good sauce. 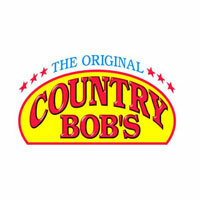 Recently I was given the chance to review a product called Country Bobs. I've used it a couple of times lately and I have to tell you I am in LOVE. The taste to me is somewhere between a BBQ sauce and a steak sauce. Honestly it reminds me of a little BBQ joint my mother use to to take me to as a kid. We have used it on Ribs while we were grilling and they were soooo....good! Just last night I had it with some smoked sausage mixed with my regular BBQ sauce. It really took my sausage from good to great! My husband(who didn't know I had done anything different) asked what I used because it was just so much better. I can't wait to try some of the great recipes available on their website. Don't miss out on the great deals and giveaways by following them on Facebook and Twitter. Remember that their is more to their product line then their sauces so make sure to check it out. You can order online or find in a store near you. Happy Sunday! I LOVE this sauce...it really is some of the best I have ever tasted! So many different ways to use it too! That smoked sausage sounds yummy! It was so good! We didn't grill I just chopped it up and fried it in a pan. Then added Country Bobs and my regular BBQ sauce and cooked on low for 10 minutes. Mmmm...so good! We love Country Bobs!! My very fussy daughter even likes it. It is a regular condiment in our home now for sure. I have always wanted to try this sauce. It sounds so great! !